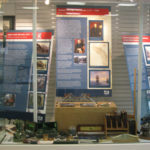 With a student scavenger hunt and a series of newsletter articles, the Philadelphia Section’s year-long centennial celebration paid tribute to the numerous civil engineering landmarks that were central to building the city, things like Philadelphia City Hall, the Reading Terminal train shed, and William Penn’s city plan. 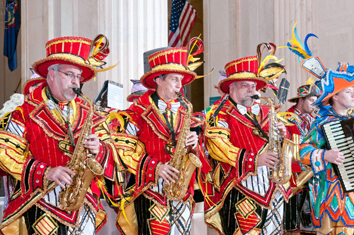 Thus, it was only fitting that another Philadelphia institution – the Mummers – were on hand to kick off the gala anniversary party at the Franklin Institute in May with a fun and festive performance. The colorfully costumed Mummers are one of the main attractions of the traditional New Year’s Day Parade down Broad Street, and they also perform locally throughout the year. 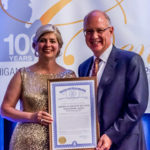 “The gala was definitely a great event to showcase the accomplishments of the past 100 years, to honor the civil engineers before us, and make our Section really strong,” Walsh added. Another highlight of the evening was viewing the nearby PECO Energy Building’s huge electric display, which congratulated the Section on its 100th anniversary. The message ran for 3 days. The evening also included a presentation by ASCE President Gregory E. DiLoreto, P.E., P.L.S., D.WRE, F.ASCE, a tour of the Franklin Institute, and a DJ and dancing. Area middle school students who won the ASCE Section awards at the local Science Fair were invited to attend with their families. 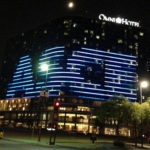 Throughout the evening, a rolling slideshow on a large screen projected photographs of civil engineering landmarks in the area. The Philadelphia Section began its anniversary events with a logo contest. “We did this as way to allow our members to get involved, which they really loved,” explained Walsh. The winning logo, designed by the Michael Baker Corporation, was announced at the Section’s Spring Social in May 2012 and used throughout the 100th anniversary year on all of the Section’s letterhead, newsletter, and emails. Like many other Sections, Walsh says the Philadelphia Section is also planning to develop a centennial book. This book will be a combination of the Landmark Guide along with photos, articles, and remembrances of the 100th anniversary events including the gala. Thanks to a well-organized fundraising effort, the Section was able to meet their fundraising goals. In April, the Section and its YMF held a 100th Anniversary College Scavenger Hunt. Engineering students from the College of New Jersey, Temple University, and Drexel University were given clues in order to find different historic civil engineering landmarks across Center City Philadelphia. Once the students found the landmark they had to take a group photo of themselves in front of the location and answer questions about landmarks. The Drexel Dragons won the competition and received gift cards. Also in April, the Philadelphia Section YMF took part in the 2013 CANstruction Competition. At its conclusion, the YMF presented a check in the amount of $1,011 to Philabundance, an area food bank and hunger-relief organization, from money raised through raffle ticket sales during the 17th Annual YMF Winter Social. The donation will provide more than 2,000 meals for needy people in the Philadelphia area. Finally, in June, the Section held a 100th Anniversary Celebration Family Picnic at the Camden Riversharks baseball game at Campbell’s Field. The event included upper-level club seating to a baseball game and a 2-hour all-you-can-eat buffet. Following the game there was a fireworks display. “We thought it would be nice to have a family event,” says Walsh. 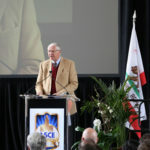 “I don’t want to speak for the whole committee but I think what we were trying to achieve with all our 100th anniversary events is to create a source of pride – being proud of the accomplishments of the ASCE Philadelphia Section and of everything that civil engineers have done in our area for the past one hundred years. Next month, learn how ASCE’s Texas Section is celebrating its centennial.